The pop singer returns with new album Rainbow on August 11. Kesha performed her single "Praying" at YouTube Space in L.A. this week. A recording of the performance can be seen in full above. 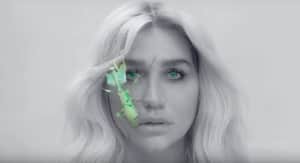 It's the first recorded appearance from Kesha since she announced new album Rainbow in July. Rainbow will be released on August 11 via Kemosabe Records/ RCA Records. Collaborators on the record include Eagles of Death Metal and Dolly Parton. So far the singer has released "Praying" plus "Woman" and "Learn To Let Go."